Have you ever thrown away something that you later regret throwing away? I have … multiple times! I’ve even been found rummaging around in the bin looking for the thing I just threw away! Here the writer of Hebrews makes a remarkable statement …. “do not throw away your confidence”. It’s remarkable because it seems that what is being suggested is that we can actively disregard confidence. Notice that the text doesn’t doesn’t say “be careful you don’t lose your confidence”, or “misplace your confidence” or even “have your confidence stolen”. The Greek word is apoballō which means to “throw off”. 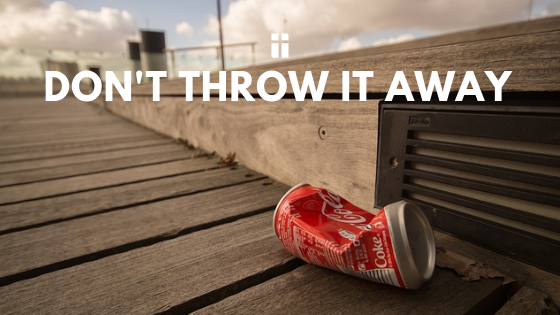 Be careful you don’t throw it away. Throwing away our confidence is our confidence in God – our trust in God. This comes very subtly. Sometimes it’s a whisper in my hear that says “You can’t do that. You’re not good enough.” Many times I’ll go along with it and begin to lose confidence in God without even thinking about it! In many ways this sounds like the message to the seven churches of Revelation 2–3 where Jesus is exhorting his church to hold on, keep the faith and pursue godliness. It’s easy to doubt. We’re called to live by faith and not by sight because the things that are a visible scream at us that God doesn’t care. So we have to practice faith. How do we do this? Well, I think the first step to holding on to our confidence is to recognise that our confidence comes from God as we seek Him. We are not confident in our own abilities but in Gods. Not our power but Gods. That’s the first thing. The second thing comes in our seeking God for it. I lost count of how many times in Hebrews the writer exhorts us by saying “Let us”. There is work to be done in apprehending what has already been apprehended for us. This is a looking to God for the answers – it’s looking to God for power and strength. It’s the humble submission to His sovereignty.